Thank you for visiting my events page. I am currently between engagements as I work on my next book, but please let me know if you’d like me to speak with your organization. 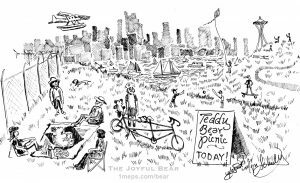 Read about the unusual teddy bear who attended the first Teddy Bear Picnic, on July 24 in Seattle’s Gasworks Park. 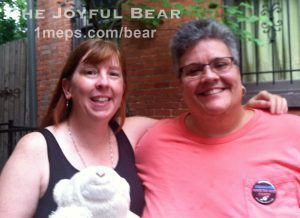 Thank you to everyone who attended the Joyful Bear presentation at University Book Store in Seattle. We got some great photos of Frankie and his fans. Thank you to those who attended The Book Loft of German Village event in Columbus, Ohio. The new cartoon series on teddy bear philosophy was a hit, and there are a couple of photos on my blog. If you missed it, we’ll be back in Columbus from October 6-10, 2016. Like to speak to you. on your upcoming tour.